A security breach at one of the most popular giants Google’s leads to shutdown the social network Google+. This is the data breach happened to Google+ since the last 3 years. Google+ was introduced in 2011 as the tech giant’s response to the rising social network phenomenon and as a rival to Facebook, Twitter, and other social networks. Unfortunately, though, it failed to gain traction despite Google’s unmeasurable efforts and backing to bring it up and boost its adoption. 1 Why the Google+ is Shutting Down? 1.1 What Will Happen to Google+ Followers and Data ? Why the Google+ is Shutting Down? Given the challenges in creating and maintaining a successful Google+ that meets our consumer users’ expectations, we decided to sunset the consumer version of Google+. We’re committed to focusing on our enterprise efforts, and will be launching new features purpose-built for businesses. Read the announcement. But recenetly happened 2 attack on the Google+ make the Google to Shutdown the Google+ before August and the new date is 2nd April 2019. The death date of Google+ was last announced on December 2018. In a report the Google confess that there is bug in API which causes the security breach of around 52 million users. Google also says that this breach does not provide data like personal information, names or email to the hackers. After the first attack on Google+ happened Google decided to shutdown the Google+ in August. What Will Happen to Google+ Followers and Data ? Since the whole Google+ account is in schedule of deleteing process so there will be no data and followers will remain after the deletion. The deleting process will begin from the starting week of April, so Download and Save all of your Google+ data like Photos, Media etc before it to be on safe side. 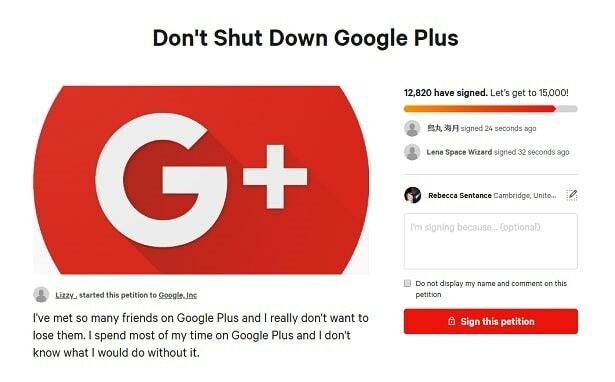 And for Google+ followers, keep posting about shutdown and tell them to move to your new social network like FAcebook or Twitter. This deleteion of account does not affect your Media and Data stored in other Google Places like Google Drive or Google Photos, they are all safe at there places so no need to worry about them. Hence the Google+ is Shutting Down on 2 April so it’s a big problem for the Bloggers and personal users. For bloggers it is a chance to move all their userbase to another socail network by 2 April. After that there will be no way to connect to Google+ Followers.